Less than one year to finish my PhD -if everything goes as it is supposed, and bad luck and me do not cross paths-, so it is a good time to know what we should expect when we start working for real -with good salary and these things. In the last issue of JEP we can find a quite interesting article for this: ‘The Research Productivity of New PhDs in Economics: The Surprisingly High Non-Success of the Successful’, by John P. Conley and Ali Sina Önder. 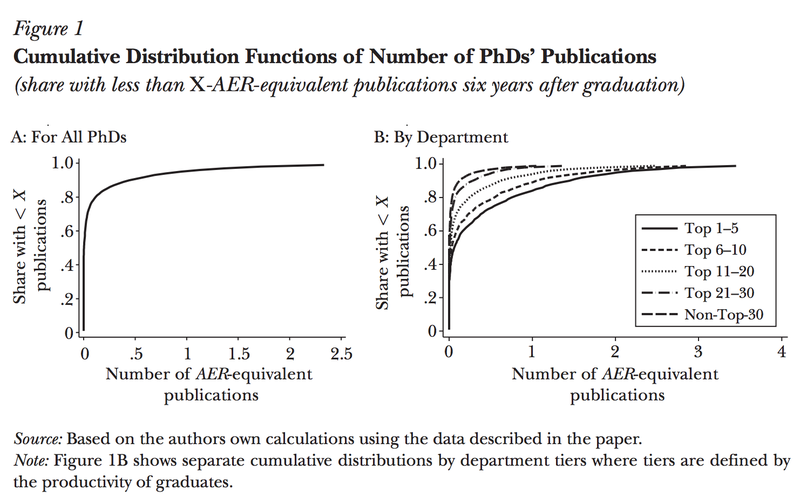 The authors collect data on economics PhD recipients from US and Canada and tracks their publications for the first 6 years after graduation (the duration of the typical tenure track). They rank the journals following a previous paper (Kalaitzidakis et al. (2003)); in particular, each publication is converted into a number of AER-equivalent. This method is a bit strange (2 REStuds = 1 AER? 3 JME (3!!!) = 1 AER? ; and what about the top finance journals -JF, JFE, RFS? ), but they also say that the results are qualitatively robust to the rank. One needs to mention Princeton and Rochester. Princeton ranks 3rd or better at each percentile (until the median, see Table 2). This means that their graduates are always among the best three institutions among equally ‘research-ranked’ colleagues. Something similar happens with Rochester, an institution that ranks ‘only’ 10th when we look at the starts but that is always among the three best for graduates below the 90th percentile. Another striking feature is that even for Top 5 institutions it takes a graduate among the best 20% to publish a single-authored AER-equivalent in their first 6 years. There might be some caveats, though. I have already complained about the journal ranking and the missing journals. Moreover, it is not clear whether the authors also consider those publications that are accepted but not published (i.e., ‘forthcoming’) at the end of the 6-year-period. Since the numbers are very small, excluding those publications might have a significant impact on the conclusions. Despite these caveats, this highlights the difficulty to publish in the very top journals and the toughness of the tenure track of the top institutions.